Our primary cartridges for point-of-use units contain both redox media (ERA 1 "Eagle Redox Alloy" aka KDF - "Kinetic Degradation Fluxion"), and Granular Activated Carbon (GAC) from coconut shells. These cartridges have plenty of GAC, and the SUBSTANTIAL amount of redox media needed to do a thorough job. Redox alloy is a relatively expensive substance. There are other brands of water purifiers, some with the same kind of housing as ours, that contain only a small amount of redox media so they may say they have it. These will do a lesser job for a shorter time than ours. Our dual and triple point-of-use units also have the option of either a fluoride removal cartridge or a solid carbon block cartridge along with the multi-stage (sediment-redox-carbon) primary cartridge. The triple can also house an ultrafiltration cartridge. Below is more information about redox and carbon as effective water treatment media. 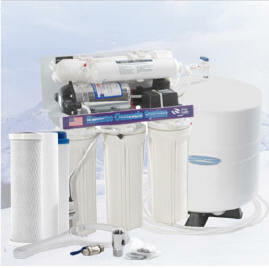 Redox alloy is the primary active media in most of our water purifier systems. The redox alloy was developed in the mid 1980's and patented in 1987 under the name "KDF" (the original redox media). It is a alloy of copper & zinc that takes care of chlorine, removes heavy metals and eliminates microbes in water processed through it. "KDF" derives from "Kinetic Degradation Fluxion", the term originally used to describe the redox principle of oxidation / reduction at play in this process. This patented process utilizes an electro-chemical reaction. Most of the systems we offer contain a newer brand of redox media, "Eagle Redox Alloy" (ERA). Redox media can remove up to 99% of water-soluble lead, mercury, nickel, chromium, and other dissolved metals. Redox is effective in controlling the buildup of bacteria, algae, fungi and scale, making it ideal for use with GAC beds, ion exchange resins, carbon block filters and inline carbon filters. Wherever redox is used, it can eliminate the need for costly, and sometimes harmful, chemical treatments. Redox alloy is 100% recyclable and contains no chemical additives. Redox media meets EPA and Food and Drug Administration standards for maximum limits of zinc and copper in potable water. High-purity copper-zinc redox alloy consistently remove 99% of free chlorine by electrochemically reducing dissolved chlorine gas to water-soluble chloride ions. In 1992, the US Environmental Protection Agency designated the popular KDF (redox) process medium as a "pesticidal device," by recognizing its bacteriostatic value in preventing contamination of carbon in water filters. By electrostatic charge, redox media has the ability to defend against the growth of algae, bacteria, fungus, mold, and many parasites found in drinking water supplies, through the natural process known as "electrochemical oxidation/reduction". No pesticidal registration is required for redox as no chemical agent is added to the water. In 1992, KDF 85® and KDF 55® process media (ERA 9500 & ERA 6500) were certified by NSF International to its Standard 61 for drinking water. In 1997, ten years after KDF Fluid Treatment, Inc. became a member of the Water Quality Association, the WQA listed KDF media in its Glossary of Terms for Residential Water Processing. That same year, KDF 55 process medium was certified to ANSI/NSF Standard 42 for drinking water. Our cartridges contain more redox media relative to the carbon than other brands. Redox alloy is far more expensive than carbon. Many companies use just a little of it to be able to say that they have it. In addition to the redox media meeting two different NSF standards, all the materials used in our water purifier cartridges are approved by the appropriate agencies: FDA, EPA, NSF & Water Quality Association. Carbon is a great workhorse media that has been used in water treatment for many, many years. Its greatest service is removing chemicals, which includes most of the agricultural, automotive and industrial wastes that pollute our waters. Carbon is effective on chlorine, but the amount of chlorine in city water would saturate and exhaust the carbon very rapidly. For this reason, carbon only filters should be changed VERY frequently. Many people are not aware of this. By preceding carbon with redox alloy in a water treatment system, the carbon is protected, as the redox takes care of the chlorine. Thus the carbon will have a much longer useful life in dealing with the chemicals that are in the water in lesser amounts than chlorine. Redox media and carbon together are a great team in removing the spectrum of problem contaminants in tap water, from bacteria, algae to heavy metals and other inorganic as well as organic chemicals. Our water systems containing solid carbon block have been tested and certified according to the NSF Standard No. 42 for chlorine, taste and odor reduction in drinking water; and the NSF Standard No. 53 for drinking water health effects in regard to reduction of cysts. These units are also registered with the EPA for being a "pesticidal device", as they eliminate parasites such as Giardia and Cryptosporidium. Some cities are now using chloramines, a compound of chlorine and ammonia, instead of chlorine itself. Chloramines are more stable than chlorine, but are still somewhat toxic. Redox media does not remove the ammonia portion of chloramines, but carbon does. Chloramines do not saturate carbon as quickly as chlorine. We recommend a dual system with the second unit with either a fluoride removal bone char carbon cartridge or a solid carbon block cartridge in cities using chloramines. The one common chemical in city water that these media do not remove enough of is fluoride. Redox reduces it to some degree, but for more thorough removal we have another media called "alumina", which is very effective on fluoride. 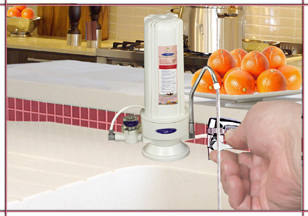 To take care of fluoride, as well as the other problem chemicals in most city water, we recommend a filter system with redox + alumina cartridge in the first housing followed by a solid carbon block in the second housing, or a reverse osmosis system. It is recommended that a re-mineralizing alkalizer be included with either of these systems to counter acidity. CLICK HERE to read more about fluoride and removing it from drinking water. Copyright 2004-18 by Natural Health Enterprises -- All rights reserved.